While doing one of my “walk-abouts” here at the Harbor last week I really took note of what a beautiful waterfront we have now. With the addition of the Capital Wheel and its nightly light show and the back drop of the Wilson Bridge and the Masonic Temple on the horizon in Old Town Alexandria, it really is pretty spectacular – most especially at dusk. The night I took the photos the weather was particularly nice. The stifling heat from the days prior was gone and the humidity had dissipated to a pleasant percentage and the sunset had been a good one. Also, pretty spectacular are the dining out options that we have on the waterfront. While I don’t want to take anything away from the other fabulous restaurants that we have here that aren’t on the waterfront there really is something to the old adage……location, location, location! If you are entering the waterfront from the intersection of Waterfront Street and American Way, once you descend the stairs you have choices on both sides. 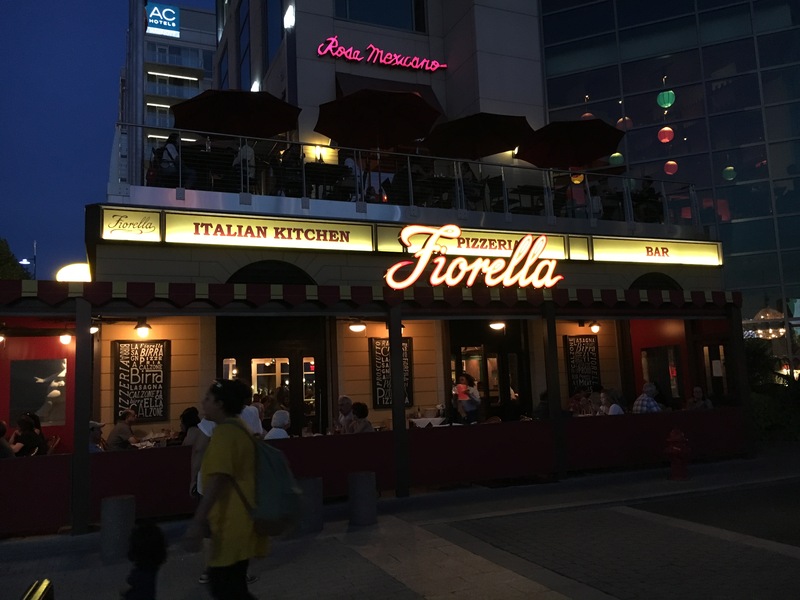 Fiorella’s Italian Kitchen, Pizzeria and Bar with *Rosa Mexicano’s balcony right above is to your immediate left and Redstone American Grill is right across the throughway. To your right is Potbelly Sandwich Works with *Bond 45’s balcony directly above. 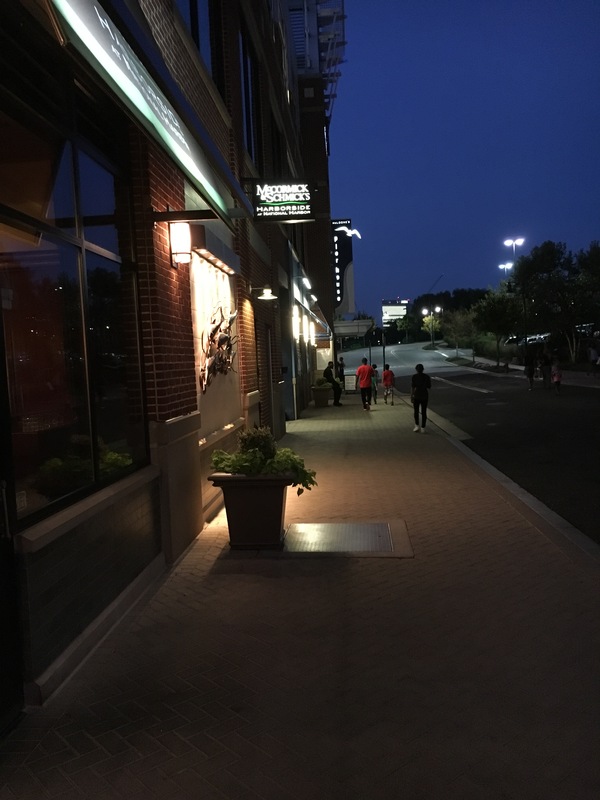 Next to them is Crab Cake Café and across the throughway and to the north you will find McCormick & Schmicks Harborside and McLoone’s Pier House. Brews & Bites is located at the end of the same pier that houses the Wheel. There is also a Chipotle on the waterfront but I am a bit biased and have never really considered them as a dining option. Don’t hate on me – it’s just my opinion. Each of these places has something that sets them apart from the others. Fiorella’s has hand-tossed pizza, Rosa has table-side guacamole service, Redstone has the only outdoor bar on the water, Potbelly toasts their bread, Bond welcomes you with a glass of complimentary Prosecco, Crab Cake serves one of the best crab cakes I have ever had, McCormick’s serves their cocktails with fresh squeezed juices, McLoone’s has a great Happy Hour and serves the only Rum Bucket in the Harbor and Brews & Bites is literally “on the water” at the end of the Capital Wheel Pier. I will give you all the low down on the other great places we have to dine in the heart of the harbor in a future column. There are lots of them!! There is always something airing on the big screen on the Plaza and most nights there is an activity on the “lawn”. Fridays are particularly fun on the Plaza with the addition of lawn games, live entertainment from Bobby McKey’s Dueling Piano Boom Box and a DJ rounding out the evening. Summer Friday’s will end on the 29th but hopefully they will bring this activity back next season. Saturday evenings the plaza host the Military Concert Series – see the calendar of events in this section for the scheduled bands. 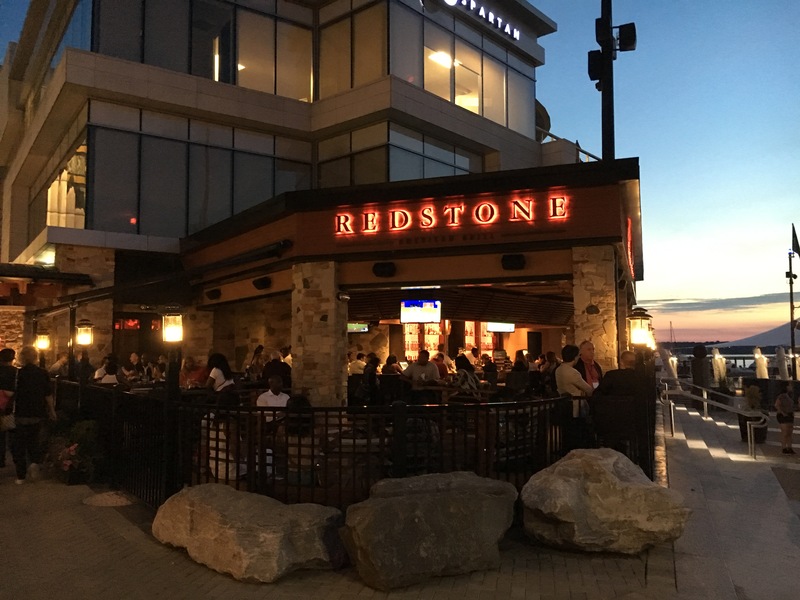 Now that fall is fast approaching and the weather should lend itself to dining al fresco, make a plan to frequent any or all of these fine waterfront establishments. Please tell them that the Old Town Crier sent you. *These restaurants are entered from Waterfront Street. There is no access to them from the plaza.